A much-needed freshen-up was the key to unlocking Larry’s winning potential. Among the rear-enders at his first five starts, the Mastercraftsman four-year-old was a totally different proposition at his comeback from a three-month break. He didn’t win right away, but his three starts, including a narrow second to King Warrior two starts back in a Maiden race over the Polytrack mile sent a strong signal that trainer Stephen Gray had found the right switches. And Larry ($14 favourite) finally smashed the door open in the $20,000 Good Luck Stakes, an Open Maiden race over the mile, on Wednesday. Ridden cold at the rear three wide but with cover, Larry was simply in a different league when he was set alight by first-time partner Michael Rodd. 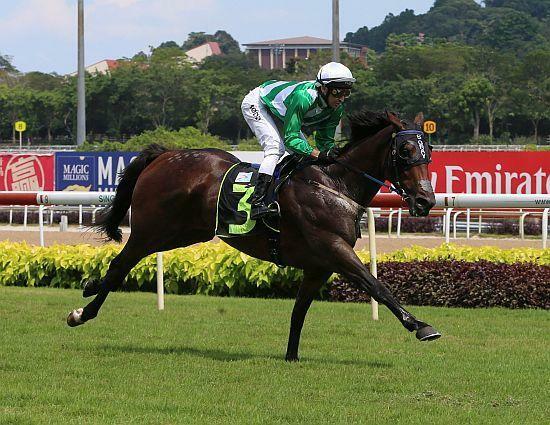 Stablemate Military Chairman (Amirul Ismadi) had the winning post in his sights as he stormed to the front, but was left without much of a response when Larry flew on by towards an impressive three-length victory. Third place went to Accumulation (Vlad Duric) another 3 ½ lengths away. The winning time was 1min 36.44secs for the 1600m on the Short Course. “He enjoyed himself out there today, he needs 2000m to 2200m races,” said Gray. “He was immature and running in better class maiden races where he couldn’t win. The owner Mr Chua was actually getting peeved with me and the horse, I think. “So, I told him the horse needed a spell to mature mentally and physically. He’s come back and won a very good race. Rodd said he knew he was on a strong winning chance when he had Larry smoking his pipe at the rear.